Nursing applications for fall 2019 are now available. 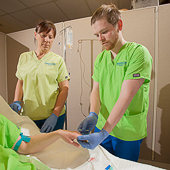 Associate Degree in Nursing (ADN) - Generic Option and Advanced Standing Option and Practical Nursing. Review the nursing application packets and application deadlines. Complete the entrance exam that is required as part of the nursing program application. Complete a nursing program application. Whether you are just beginning or continuing your nursing career, we are excited to provide you with an excellent educational experience. While all students are welcome to apply to M State's nursing programs, admission is competitive. There are specific criteria for each program. Many students take general education courses at M State - including courses in mathematics, biology and chemistry - in preparation for application to the nursing program. Although not all of these courses are required for program applicants, they may improve an applicant's eligibility. If you're a high school student who plans to enroll in a nursing program, you will benefit from taking high school courses in biology, chemistry and mathematics. Please note: Nursing students are required to take four credits of Anatomy and Physiology I that includes a lab, four credits of Anatomy and Physiology II that includes a lab and four credits of Microbiology that includes a lab if those courses are part of the program plan. Applicants requesting to transfer three-credit Anatomy and Physiology I, three-credit Anatomy and Physiology II or three-credit Microbiology from another institution are required to take a one-credit lab in order to make up the required credit difference and/or lab component. The Minnesota State Community and Technical College, Associate Degree Nursing (system-wide) and Practical Nursing (system-wide) programs are pursuing accreditation from the National League for Nursing Commission for Nursing Education Accreditation (NLN CNEA), located at 2600 Virginia Avenue, NW, 8th Floor, Washington, DC 20037; phone 202-909-2500. Interested parties are invited to submit third-party comments in writing directly to NLN CNEA, attention Lusetha Rolle, NLN CNEA Manager of Accreditation Services, no later than January 30, 2019. All M State Nursing programs are approved by the Minnesota Board of Nursing. The Practical Nursing program at Minnesota State Community and Technical College has been ranked as the No. 2 PN program in Minnesota by PracticalNursing.org. Colleges offering PN programs were assessed primarily on pass rates for program graduates in the NCLEX-PN licensure exam over a five-year period. Twenty-six Minnesota PN programs were analyzed, and 10 were ranked. The 2017 NCLEX-PN pass rate for graduates of M State's PN program was 95.92 percent, compared to a rate of 86.22 percent at all Minnesota colleges and a national rate of 83.85 percent. M State's pass rates were 91.67 percent in 2016, 97.59 percent in 2015, 98.89 percent in 2014 and 98.17 in 2013. "I believe our historically high pass rates for students in our Practical Nursing program reflects the excellence of our M State nursing instructors," said Jennifer Jacobson, M State's dean of health careers. "We take great pride in preparing future nurses for successful careers in the health care profession." M State offers a full-time PN program on the Moorhead campus with both fall and spring starts. For more information about M State Nursing programs, visit Minnesota.edu/programs/nursing. PracticalNursing.org is an online resource that "champions the growth of nursing professionals through education, advancing knowledge and inspiring patient care." This is the second year in a row that M State has been ranked among the organization's top programs in Minnesota. In March 2019, Corey Knauss received the Caregiver Award from the North Dakota Long Term Care Association following his nomination by families that he serves in his job as charge nurse at Eventide Fargo. "I had a 21-year profession as a massage therapist, and unfortunately my body could not keep up with the work. I chose M State Detroit Lakes (for my nursing degree) after researching courses and costs from a number of schools. The drive through the winters from (my home in) Moorhead to Detroit Lakes got old, but the education - not only the classes but also the practical experience - was greatly worth it. I was working full time and had a child on the way. This was probably not the most effective way to go through the nursing program, but I was lucky enough to have Cindy Moore and Angie Mohr as instructors and friends. They knew how to motivate you and prepare you for what has been a short yet amazing career. "Our class was definitely prepared for the dreaded NCLEX licensure exam, and we nailed it as a whole. I earned my RN degree in December 2016 and started at Eventide Fargo in March. I chose long-term care due to having great clinical experiences in Frazee under the amazing guidance of Cindy Moore. What I enjoy most about long-term care is relationship-building with the residents, their families and the providers. I love where I am at!" "I knew several people who went through the nursing program in Fergus Falls, and I really appreciated the opportunity to go through an affordable two-year RN program. My favorite part of my classes is getting to work with my classmates on school projects, presentations and volunteer projects. I have the best classmates! "Being the oldest in a large family, I have always wanted to take care of and make a difference in the lives of people who are hurting. Choosing to major in nursing was an obvious choice. This spring, I am planning to travel to Angola to help friends who are serving in a hospital as a doctor and nurse practitioner. The hospital is located in a large city where one in three children do not survive to age 5. The need there is tremendous!" Lydia Bradrick will graduate in Spring 2019 from the Associate Degree in Nursing program. Members of the M State Nursing Organization brightened the holidays with a successful collection drive for Someplace Safe in Fergus Falls. Nursing Organization members, all first- and second-year nursing students on M State's Fergus Falls campus, collected 230 items and more than $130 for Someplace Safe, a non-profit that serves families and victims of domestic violence and sexual assault in a nine-county area. The donated personal care items and baby supplies, collected on the Fergus Falls campus, filled six full boxes that were delivered to Someplace Safe before Christmas. 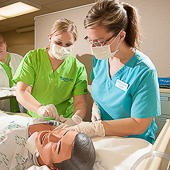 The Practical Nursing program prepares the student to practice within the scope of the practical nurse.The student is taught to use the nursing process in the maintenance of health and prevention of illness, the observation and nursing care of individuals experiencing changes in health status and the administration of prescribed medication and treatments. The student will receive supervised learning experiences in caring for individuals in a variety of health care settings such as hospitals, long-term care facilities and physician clinic settings. Practical Nursing graduates may apply to take the National Council Licensing Exam-PN (NCLEX-PN) following graduation. Individuals entering the program must pass the background check required by the Minnesota Human Services licensing division and an annual National Background Check. 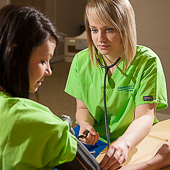 The Practical Nursing program is offered on the Moorhead campus. The Minnesota Board of Nursing has officially approved the Practical Nursing program at M State. The Associate Degree Nursing program is designed for students with no previous nursing experience who are seeking to become registered nurses. The Detroit Lakes, Fergus Falls and Wadena campuses offer the two-year Generic Option program. The Associate Degree Nursing program is designed to prepare students to deliver nursing care in a variety of settings as registered nurses. The graduating nurse will be able to provide nursing care in hospitals, long-term care centers, clinics, community health and other health-related facilities. Upon completion of the nursing program, an Associate of Science degree is awarded by the college. Nursing graduates may apply to take the National Council Licensing Exam-RN (NCLEX-RN) following graduation. Individuals entering the program must pass the background check required by the Minnesota Human Services licensing division and, depending upon particular clinical partner expectations, also may be required to pass an annual national background check. The Minnesota Board of Nursing has officially approved the Associate Degree Nursing program at M State. The LPN to Associate Degree Nursing Advanced Standing option is designed for licensed practical nurses seeking to become registered nurses. This option is offered at the Detroit Lakes, Fergus Falls, and Wadena campuses. Students who have taken the required general education prerequisites and are accepted to the program take a two-credit Role Transition course in the semester prior to the start of their program and then join the Generic Associate Degree nursing students in the second year of their nursing program. The Associate Degree Nursing program is designed to prepare students to deliver nursing care in a variety of settings as registered nurses. The graduating nurse will be able to provide nursing care in hospitals, long-term care facilities, clinics, community health facilities and other health-related facilities. Upon completion of the nursing program, an Associate of Science degree is awarded by the college. Nursing graduates may apply to take the National Council Licensing Exam-RN (NCLEX-RN) following graduation. Individuals entering the program must pass the background check required by the Minnesota Human Services licensing division and, depending upon particular clinical partner expectations, also may be required to pass an annual National Background Check. The Minnesota Board of Nursing has officially approved the Associate Degree Nursing program at M State. State law requires students having direct contact with individuals in licensed institutions complete an annual background study with the Minnesota Department of Human Services. Students are also required to complete a national background check and may be required to complete a federal background check as directed by clinical facilities. Students will be provided with instructions after they are accepted. The fee for the national background check is incurred by the student at the time the background study is submitted. Accepted students who choose not to complete the required background studies OR are not cleared to provide unsupervised care, will not be able to attend clinical, laboratory, simulation, or service learning experiences until the study is deemed clear. Such delays may affect successful completion of nursing courses and or the program. Additional details regarding required background checks can be located in the Nursing Program Policies and Procedures Manual at https://www.minnesota.edu/nursing/accepted/ . To improve student success, nursing faculty at M State have selected an integrated learning product from Assessment Technologies Institute (ATI). While the product is used in every course, students purchase the product through student fees attached to particular courses within each program. For information on Fee Assessment, please see the attached 'ATI Fee Assessment' document. We encourage prospective nursing students to schedule a visit at the campus of their choice. Arrange a campus visit by contacting M State at 1-877-450-3322 or visiting minnesota.edu/visit. NURSING ARTICULATION IS DEFINED AS the intentional planning and coordination of nursing education programs so that the program at one level serves as the foundation for the next educational level. The goal is to help students make transitions that are smooth and seamless, educationally sound, and do not require revalidation. The Minnesota State Colleges and Universities Statewide Nursing Program Transfer Agreement provides a pathway for transition from the Practical Nursing to Associate of Science in Nursing as well as Associate of Science in Nursing to Bachelor of Science Degree in Nursing. Students considering advancing their degrees through this process are encouraged to read the articulation agreement in its entirety and consult with a Student Development Services advisor as they plan their educational transitions.